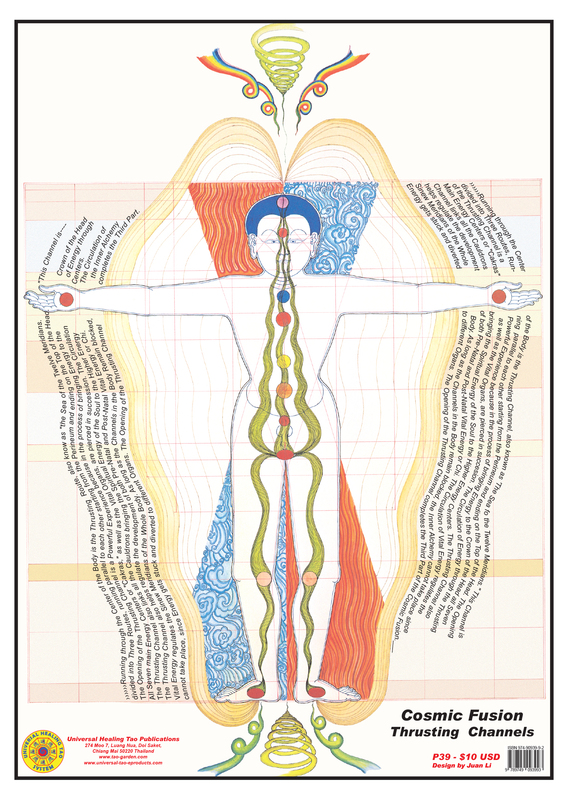 This poster illustrates the Male Body with the Thrusting Channels of Cosmic Fusion with the detail explanation surrounding figure, beautifully illustrated by Universal Healing Tao Senior Instructor Juan Li's original meditative art drawings. Through the Advanced Fusion II meditative practices you move the Compassion Pill through the Functional, Governing, Creative, Thrusting and Belt Channels of the Energy and Spirit Bodies extending from the Physical Body (As Below as Above) and adding the Protective Animals and Planets around them. Through the techniques of Fusion II you are opening your body to the Universal Forces of the Earth (Mother-Blue Energy), Heaven (Father-Violet/Red Energy) and Atmospheric Level (Human-Cosmic/Golden Energy). The Cosmic Fusion practice builds on the foundation Inner Alchemy (Changing One Substance into Another) established in Fusion I nurturing the vital organs with the Golden Compassionate heart throughout the Three Bodies (Physical, Energy and Spirit).